I have been able to help a range of clients in different industries achieve crowdfunding success. This is through careful execution and avoiding the many pitfalls which thousands of entrepreneurs fall into. According to Kickstart’s statistics page, a crowdfunding campaign is more likely to fail than succeed. As of writing ~70% more campaigns failed to reach their funding goal than the ones which met or exceeded their goal. I don’t tell you this to scare you, but to show you that there is a lot to consider when launching a campaign. 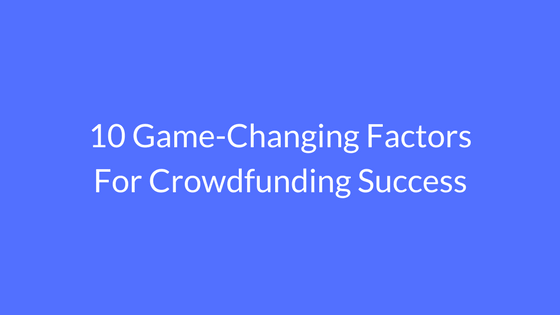 The 10 game-changing factors for crowdfunding success below will help you to avoid the pitfalls and get your campaign fully funded. Having a great product is important. However, you need to get people to your page in order to see it. The press, bloggers and influencers can amplify your message and get people flooding to your page. When most entrepreneurs think of outreach for their crowdfunding project, they imagine sending a press release blast or emailing as many top journalists as they can once their campaign launches. Your outreach strategy should be arranged long before launching the campaign. This is to give you time to build relationships and get influencers on your side. That way once your campaign launches, they are eager to promote it. It is essential that you match your outreach to people who match the industry your product is targeted towards. The closer the match, the better. One simple way of doing this is to search for fully funded projects in your industry on Google. Take a look at the journalists, bloggers celebrities and people who tweeted about it. Reach out to them before the start of your campaign. Keep your message short. State that you will be launching a crowdfunding campaign in the near future, what your product is about, how it is different, the stage of development and how it can help make people’s lives better. Then simply ask whether they would like to see images and find out more about it. If you don’t get a reply after a week, send a followup. You can automate the followup process by using ifnoreply.com. The outreach process is an opportunity to gain advocates prior to the launch of your campaign. You can use thunderclap.it to ensure that advocates spread your crowdfunding campaign at the same time. I was having lunch with a friend and he mentioned that he was planning on launching a crowdfunding campaign. Since that is what I help people with, I was keen to give him my best pieces of advice from launching many successful projects. Before I could do that, he hit me with “It can’t be that hard. I just need to put it up and people will come. Easy.” I had to catch my jaw to stop it from hitting the table. A common misconception is that a crowdfunding campaign isn’t as serious as a product launch or that it is the easy way. As a result, people fail to plan. A huge benefit of crowdfunding is that you are able to build a tribe, collect the contact details of backers and test out your product on the market. These are luxuries which make subsequent launches much easier. 1) Content pieces needed for your campaign and the best people to produce it. 3) A list of influencers, journalists etc., which you plan on targeting. 4) The social media marketing plan: Facebook ads, Youtube video ads, etc. 6) A timeline to keep you on track. We live in an image-conscious world. With attention spans on the decline, you need to grab people immediately if you want crowdfunding success. This is because most people skim pages. The visuals for your campaign need to showcase your product in the right setting. For instance, if your product is to be used in an office, get shots of it in an office. A busy journalist is likely to quickly glance through the images first before deciding whether to read the product details. Therefore, you need to put your best foot forward. You can get great value by using a student photographer. The risk is that you aren’t 100% sure of what you will get. A professional product photographer would cost significantly more; however, they are more likely to get you shots you can be proud of. You can use canva.com and/or Adobe Spark to create attractive images at low cost. – Shows how the product can transform people’s lives. – Shows the product being used in a relevant setting. Using an experienced videographer is likely to give you a polished end result. After all the time and effort put into a campaign, it is sad that many entrepreneurs put little thought into their perks. You need to think about the cost of fulfilling your low cost perks, and whether you can actually fulfil the higher cost ones. Each perk has to be attractive. T-shirts and small accessories are typically used for lower cost perks. However, in the digital world that we live in, you can be a bit more creative while reducing costs. You could offer a mention on your website, offer an exclusive eBook or the opportunity to have input in future versions of the product. If you are stuck for ideas regarding which perks to offer, look at fully funded campaigns in your target category. See whether you can use some of their ideas as inspiration for your campaign. – Does your product solve a problem? – How many people are likely to need it? The bigger your target market, the more likely it is that you will reach your funding goal. – Have you presented your produced to a small group of members within your target market? What did they think of it? It is vital that you have a good support network if you want crowdfunding success. Remember that this is an opportunity to launch your product and have the contact details of every single backer on file. This is huge and enables you to launch more innovative products much more easily. – Digital Marketer: They can help you to get your crowdfunding campaign in front of thousands of the right people. A digital marketer can also help you with the outreach part of the campaign. – Copywriter: Persuasive writing is an art form. A good copywriter is able to write copy so irresistible that it makes visitors feel a need to back your campaign. – Digital artist: This is someone who is good at image editing and.or creating professional looking videos. A ‘tribe’ of passionate advocates increases the likelihood of crowdfunding success. The driving force for any crowdfunding campaign are people. When approaching influencers and journalists, your chance of a response improves dramatically once you are able to show them impressive engagement numbers and fans on social media. It shows that your project has momentum. Building a tribe can take some time; therefore, it is crucial that you start as early as possible. Look for events which your target market are likely to visit. Perhaps, you could ask permission in order to add a banner, or even showcase your product, and take the opportunity to collect contact details. You could also use Facebook video ads to increase interest and grow your tribe quickly. Transparency and authenticity go a long way. Some people will back your campaign even though they don’t plan on using the product. However, they can see the benefits it will bring to other people, and that you are trying to do something incredible. Remember that you are asking people to back a project which may or may not see the light of day. Unfortunately, some projects fail to deliver on time; therefore, entrepreneurs have to be more open and convincing. Let them know how their backing will help the project to grow and reach more people. Show them the impact you hope the project will have. Nothing good has ever come about without hard work. We are lucky enough to live in a time when you don’t have to go to the bank and agree to a high-interest loan in order to get your venture launched. However, that doesn’t mean that crowdfunding is easy. After consulting with many entrepreneurs, and achieving crowdfunding success with other campaigns, “hustle” has been a major factor. They are determined to see the campaign succeed, and are willing to leverage my knowledge and experience to make it a success. You should be willing to do what is necessary in order to launch a successful crowdfunding campaign. In conclusion, I hope now you know the secrets to crowdfunding success. I have helped many companies launch very successful crowdfunding projects. Collectively, I have helped to raise millions of dollars. You could launch your crowdfunding campaign on your own, and go through stress and potentially make some costly mistakes. Alternatively, you could leverage my experience and eliminate luck. Get in touch and let’s talk about how I could be of service to your crowdfunding project.